There is a deeply ingrained model-mind program of ‘survival of the fittest’ of ‘the early bird gets the worm’, of ‘dog eat dog’, of ‘there’s no free lunch’, of ‘it’s not personal, it’s just business’, of ‘business is war’, of ‘nice guys finish last’, ‘In sweat and toil shalt thou earn thy bread.’ etc. This is the old model, the old way that is not working anymore. This model creates pain for everyone – for the ‘workers’ and the ‘owners’. Most ‘successful’ people have a short season of enjoying their ‘success’ and then back to their personal problems and miseries. There’s a deep feeling in many humans still of ‘it has to painful to be gainful’. It has to be ‘hard work’ to accomplish anything. Whenever the TV news has a ‘success’ story on it, the ‘successful’ person always say the same thing ‘Hard work, Hard work, Hard work… But is that really true? Why do bankers hardly work at all? We even call it ‘bankers hours’? The Bank owners simply live off interest that others pay them on money? Is it that the real people with power & money want everyone else to ‘Work Hard’ so they themselves can just lend them more money to make more interest off? Something’s ‘off’ with this model don’t you think? Some may say our ‘toil and sweat’ can be traced back to Calvinists, religionist Protestants with dour faces, the white ‘protestant’ work ethic (why are we still ‘protesting’ & what are we ‘fighting against’ anyway?) Aren’t we tired of being ‘crusaders’ and fighting, fighting, fighting? Against everything? The War on Drugs, The War on Fat, The War on teenage pregnancies, The War on drunk driving, The War on smoking, The War on Everything? Aren’t we tired of War – ring with everything…including our Selves? What are we fighting against? Why can’t we relax? Watch the cars on a freeway sometime – see all the cars manically ‘driving’ somewhere, pushing somewhere — and then a few hours later the same cars pushing-driving-striving in the other direction to go back ‘home’. 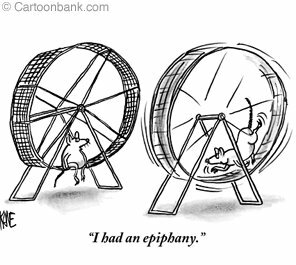 What’s the real difference between that and the hamster in the wheel? their noses are tapering, their faces are lined and disfigured with wrinkles. The way this deep rooted model of ‘in toil and sweat shalt thou earn thy bread’ or ‘No Pain, No Gain’ manifested itself in the ‘vacation’ world is we had our vacations to ‘get away from it all’ – to ‘vacate’, ’empty out’ all the accumulated stress, worry, ‘pain’ we were using in order to get out ‘gain’. No wonder if ‘life is a battle’ all the time that then of course we’d want to get away from IT all. So we took our vacations and ‘did nothing’, the proverbial beach with an umbrella and a drink! Our vacations were to ‘Vacate’ to ’empty out’ all the ‘stuff’, the ‘soul tartar buildup’ from stressing ourselves. Look at the Corona beer commercials still- perfect, nothing to do except to ‘drink our troubles away’. Except of course we all know – that doesn’t work- except for just a little while.